Skylark Class is taught by Mrs Ready and supported by Mrs Shin alongside Mrs DeQuincey. Robin Class is taught by Mrs Morgan and Mrs Harris (Fri am) and supported by Mrs Heavens alongside Mrs Salmon. Woodpecker Class is taught by Mrs Atkinson and Mrs Harris (Tues) and supported by Mrs Attwood-Smith alongside Mrs Caswell and Mrs Pockett. On Wednesday, Year 3 invited their parents and carers in to view a slideshow of our recent trip to Sayers Croft and to share the work relating to our first learning enquiry of this half term 'How can I be a great team player?'. We enjoyed reminiscing the fun moments of what one parent described as 'an unforgettable experience'. We certainly made lots of fond memories! Year 3 are currently learning about the impact deforestation has on our rainforests and in turn, our world. The children spent a long time creating beautiful pictures of what rainforests look like before deforestation to then be instructed to rip them up and destroy them, just like the rainforests. We certainly felt the impact that had on us and it helped us to reflect on the large scale impact deforestation has on our world. The photo below shows the picture before being destroyed. Woodpecker Class would like to welcome the new whole school pets, Ash and Ley! They will live in and be cared for by Woodpecker Class but there will be a rota for every class to come and pet them at 'Guinea Pig Club' every Friday. We hope they will be very happy in their new home! Although it was just last week, it seems like a long time ago now when 90 children and some adults ventured down to Cranleigh in the heart of Surrey to have an adventure in the outdoor learning centre 'Sayers Croft'. We all had so much fun, learnt a lot about ourselves and the staff were very proud of the children. Please enjoy seeing a selection of the photos below. More will be shared at the Year 3 great works soon. With our upcoming residential trip to Sayers Croft the children have been thinking about what it means to work as a team. They made the most of the sunshine earlier this week and headed outside to create their own teams and work together to create a picture using shapes and natural resources. Year 3 have been very busy with their learning last week, impressing their teachers with their skills of focus and concentration when presenting a beautiful non-chronological report about their chosen rainforest animal. In PE we have been exploring how to create a sequence of different balances and rolls and our artwork has been linked to the animals found in the different layers of the rainforest. Earlier this week Year 3 were treated to a visit by Tropical Inc. and their amazing exotic animals. Steve, the animal keeper brought snakes, lizards, frogs, spiders, birds, a skunk and a desert hedgehog for them to find out about, look at and handle. Every child was given the opportunity to handle an animal and most of them said yes! When asked what the cleverest and most dangerous animal in the world is the children were shocked to discover that it's us humans. It put our potential fears of these harmless creatures into perspective and gave us courage to get that bit closer. Year 3 invited visitors in and thoroughly enjoyed sharing their learning with them. They made a grand entrance to fully exhibit their stunning Roman shields and their handmade mosaics were arranged together to create an impressive display. Some time spent looking through their beautifully presented topic books was appreciated by all. Thank you for coming. Chertsey Museum visited us to share a mixture of genuine and replica Roman artefacts. The children got to handle the replicas and observe the genuine ones. Writing on beeswax tablets was a new experience and not the sort of 'tablets' the children are used to! They all thoroughly enjoyed being immersed into Roman life. Year 3 became Roman soldiers using their geometry learning to create these stunning symmetrical shields. We then took the shields out into the battle/playground to re-enact traditional Roman soldier formations. 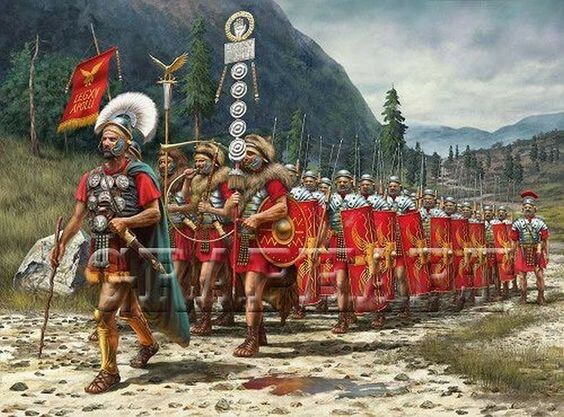 The Roman army was the backbone of the empire’s power, and the Romans managed to conquer so many tribes, clans, confederations, and empires because of their military superiority.